Welcome to Morgan-Eaves Real Estate. It's our mission to find you the perfect home for sale in Plainview or the surrounding communities of Hale, Swisher, and Floyd counties. Morgan-Eaves is a full-service real estate brokerage firm that handles residential, commercial, farm, and income-producing properties. We also provide complete property management services for our customers. Customer satisfaction is our primary goal at Morgan-Eaves. We believe that honesty, integrity, and full disclosure of all integral facts in meeting customers' needs are the essence of our existence. We follow the Golden Rule at Morgan-Eaves. It's the essential focus of our business philosophy! Plainview is a progressive city located in the Panhandle of Texas. The population is just over 22,000 people with the surrounding area sporting another 10,000. Plainview is within a 1 hour drive of two larger cities: Lubbock and Amarillo. Our climate is nice with an average temperature of 68 degrees and four distinct seasons. We are the proud home of Wayland Baptist University and within a daily commute you can find Texas Tech University, West Texas A&M University, Lubbock Christian University, and South Plains College. Property and Sales taxes are low and there is no state income tax. Our community, schools, and neighbors make Plainview a great place to live. 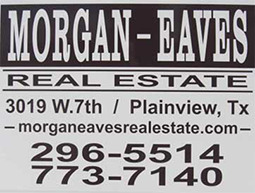 We invite you to contact us at Morgan-Eaves Real Estate at (806) 773-7140 with any questions you may have regarding the buying or selling of real estate in Plainview and the surrounding areas. 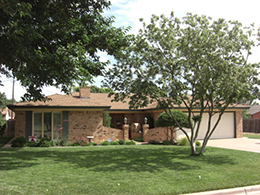 We can also help you find the perfect rental property in Plainview to meet your current needs. We are a member of the Plainview Association of Realtors Multiple Listing Service, which allows us to make appointments and show you any property in town. 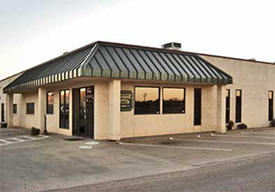 We are located at 3019 West 7th Street in Plainview, next door to Happy State Bank. We're on the south side of 7th between Ennis and Canyon streets.